I love baking and I love to do decorative cakes as and when I get a chance to make one. I do birthday cakes for all in my family. I am an amateur and still learning. But I know practice makes all perfect. So I never miss a chance to practice. 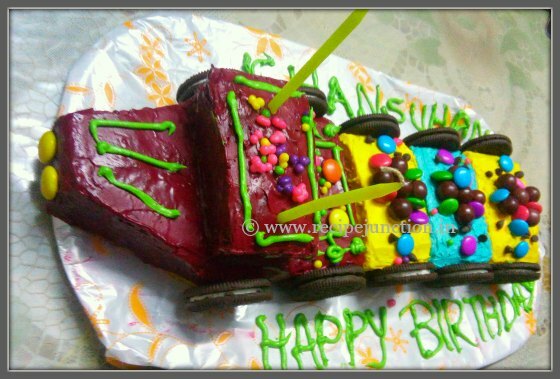 This train cake I made on my twin sons' birthday this year who love trains. This year it was just family function and I was in short of time to make a elaborate birthday cake. But I had to fulfill their demand too. So, I made a train cake which needs very less time to make and assemble. I made an eggless and butterless lemon sponge cake. You'll get the recipe here. 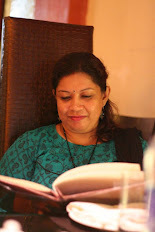 You can also make an eggless Vaanilla flavoured sponge cake too, get the recipe here. You can also opt for a Chocolate cake too. Here is the recipe for Chocolate cake(eggless) and chocolate cake(with egg). For making this cake, you need 2 8-9" loaf cake. 1. First I made two cakes in loaf form. Then cut in small rectangular portions to make the compartments of the train. 2. 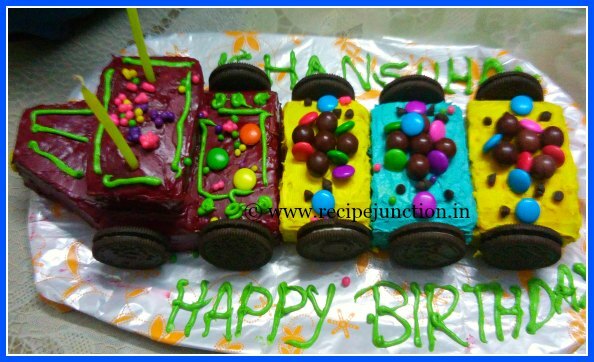 I made a buttercream frosting and coloured with different colour and then assemble them in a shape of a train. 3. Then I decorated them with colored Gems and other colored goodies. For wheels I used Oreo cookies. In a bowl, mix powdered sugar and butter electric mixer on low speed. Stir in vanilla and 1 tablespoon of the milk. Gradually add just enough milk to make frosting smooth and spreadable. If frosting is too thick, beat in more milk, a few drops at a time. If frosting becomes too thin, beat in a small amount of powdered sugar. Make the cake beforehand and cool. It should be in room temperature. Now cut the cake into small pieces for train compartments. 4 to 5 is enough or you can add more if you want. I made For the engine, I took a big piece and cut a small triangular piece diagonally from the front. Divide the frosting into 3 to 4 parts and add few drops of different food color to color each frosting. Now apply different color frosting to train compartments. Now assemble all pieces on a serving tray. First put the engine pieces at the front. Then put one train compartments (rectangular pieces) on top of the engine at the back side. Then arrange other compartments(rectangular pieces) one after other in a row. Now your structure is ready and it's time to decorate the train with some goodies kids love. I pasted two Oreo cookies on both sides of each compartments as wheels. Then arranged some colored Gems candies on to of each compartments as train is carrying some goods. You can decorate the train any way you want with other stuffs kids like. I put two yellow Gems as a headlight of the train. And we are done. It was not very good looking train but I tried my best to decorate the train within 30 mins. time. My kids and everyone present in the party enjoyed the cake and that matters the most. If you like the cake or have made this cake using my tutorial, then let me know. Happy baking and creating wonderful food !!!!! !